My father is a 76-year-old retired pastor. Unfortunately, he had degenerative narrowing in his spine around the neck area that required surgery 11 years ago. The nerve damage resulted in a permanent limp of his left leg which made him less mobile, which meant he gained weight, which has made him even less mobile and so it goes. Going on a family vacation to Paris on the way to a safari in Tanzania was definitely not his choice. But he acquiesced to peer (family) pressure as he normally does nowadays. In Paris he carried a cane. It was, however, a good experience for him. Whenever he got on the Metro the Parisians warmly offered their seats to him. Once as I was about to help him across a small crosswalk, a car playing music with a loud bass pulled up to the intersection barely crossing the pedestrian line. The young monsieur actually backed up the car and turned off the music, waving us across with a nod. see such natural respect for the elderly. Paris may be famous for its renowned landmarks and its delicious foods, but my parents left most impressed with the manners and warmth of the French people. Posted in People & Culture, Travel and tagged elderly, Paris, Tourist. Bookmark the permalink. Great story John… My dad is 91 now and I know the times we have with them is building a legacy that is treasured. Also good to hear about the French. We always hear how arrogant some are, but I think it is a typecast that has somehow given way to the notion that they hate all Americans and are rude to us. Thanks for the comment Rob. 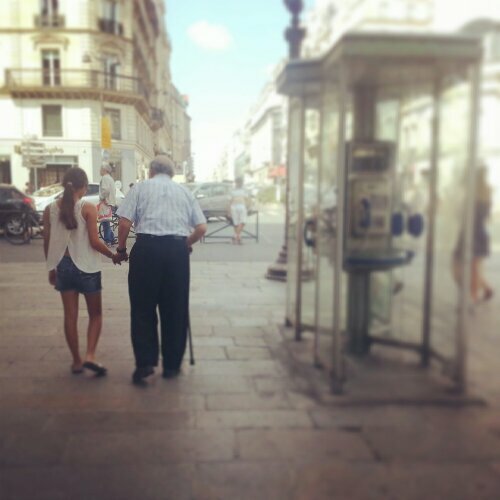 Respect for the elderly should be universal. Hi Kathryn, thanks so much for reaching out. I will forward his email to you shortly. He was only able to do his work by the kindness of people like her. give Marie the information. She is 96 years old now but still doing really well. She and I are prayer partners. God bless and keep you.